Suspicious Heuristics: Why won't the U.S.P.S. just go out of business? Oh wait, they're not allowed to. Why won't the U.S.P.S. just go out of business? Oh wait, they're not allowed to. Ah, the Postal Service. Famous for friendly service, reasonable fees, and murderous rampages. In spite of birthing the saying "going postal" the USPS has still taken the coveted "most trusted government agency" for the last five years (probably because you have to give them your things before they break and steal them, unlike most other federal agencies). What I wonder is, if everyone trusts them so much, why can't they turn a profit? Let's find out. The current hard times haven't been kind to the Postal Service, but their problems started even before that. The USPS was never expected to turn a profit, perhaps the only goal which they have met and exceeded. The intent was for them to be "revenue neutral" but the reality has been more like "revenue rat-hole." The taxpayers have shelled out billions of dollars to keep the agency afloat, but in spite of this, "USPS could reach its $15 billion statutory debt limit by fiscal year 2011" [from the GAO]. Can't we just close the doors and outsource to FedEx already? When private businesses run into hard times, they cut costs, streamline their processes, and reduce rates to draw business from their competition. The Postal Service has chosen the opposite strategy by continually increasing the cost to send mail, then whining about "the ailing economy" as a primary reason that mail volume has gone down (strangely enough, UPS is doing just fine). 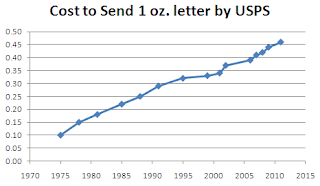 To the right, you can see the cost of sending a letter over the last 35 years. That upward line isn't just inflation talking -- "rate increases have averaged about 70 basis points greater than CPI annually." If the price of a dozen eggs had gone up similarly, it would cost $3.54 in 2011, about double the actual price. Somehow, I'm pretty sure that the quality of mail service hasn't improved by a factor of 4.6 to compensate. Source. In spite of its "pseudo-business" status, the USPS is still exempt from federal taxes. This should give it a substantial advantage, but it hasn't been enough to overcome the bureaucratic mindset, inefficiency, and general incompetence which have generated substantial losses for years. Now, I won't have it be said that I complain about a problem, then do nothing to fix it. Out of sympathy for the Postal Service's budget woes, I'll make a point of using their services a little extra. 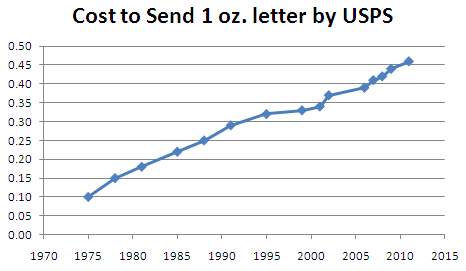 That's why I've decided to flat-rate box as many bricks as I can fit, then send it to my old address in Spokane. If there's a God, karma, or some other universal force out there, then the morons who broke all my stuff will drop that 50 lb. box on their slow, stupid feet. Repeatedly. Hope it's worth the $10.50, jerks. Once again, the culprit is the public unions. I don't know if the USPS guys are even union, but they participate in the FedBen programs. Approx. 80% of USPS' costs (and by extension, the public's costs) are spent on wages and benefits. The actual shipping (i.e. flying our letters to Santa in the big plane) is contracted out to private companies. This is how they manage to post a $3.5B quarterly loss. And keep trucking along. FedEx and UPS, meanwhile, continue to look strong.